The Vermont eviction notice forms are to be used by the landlord as a first step in the eviction process. Notice must be given to the tenant that he or she is not paying rent or is engaging in other activity in breach of the lease before action can be taken in court. If landlord provides proper notice and the tenant does not respond in the time provided, landlord may then go to the local Vermont Superior Court, Civil Division to file a Complaint for Ejectment. After the tenant is served, he or she has twenty (20) days to file the Answer. If the landlord prevails, the court will issue a Writ of Possession which will entitle landlord to the premises. 14-Day Notice to Quit (Non-Payment) – This notice is required in the event that tenant has failed to pay rent. The tenant will have 14 days to pay before the landlord can begin court proceedings. 14-Day Notice to Quit (Criminal Activity) – This notice is required in the event that the tenant is engaging in illegal activity on the premises and landlord seeks to have the tenant removed. If tenant fails to move after 14 days, only then may a landlord go to court to seek ejectment. 30-Day Notice to Quit (Non-Compliance) – If a tenant is breaching any other term of the lease, landlord must give him or her 30 days to rectify the problem or move out. 60 or 90 Day Notice to Quit (Month to Month Tenancy) – If there is a month to month tenancy and landlord want to end it, the landlord must provide 60 days notice if the tenant has not been living at the premises for more than two years. If the tenant has been living there for more than two years, landlord must give 90 days notice. Rent is due on the day set forth in the lease agreement between the tenant and the landlord, however, landlord has to give a tenant fourteen (14) days notice to pay before he or she can start the eviction process. Step 2 – If the tenant fails to respond to the notice within the time allotted, the landlord may proceed to the Vermont Superior Court, Civil Division in the county in which the property is located and file a Summons and Complaint with the clerk. The complaint is called a Complaint for Ejectment. Step 3 – The Summons and Complaint must be served on the tenant and the tenant will have 20 days to answer. If the tenant does not answer or the landlord otherwise prevails, then the court will issue a Writ of Possession at which point the tenant will be obligated to vacate the premises. Find the Lease concerning the Landlord, Tenant, and Property being focused on in the Notice you wish to issue. The first line below the title, labeled as “To,” is reserved to introduce the Recipient of this Notice. That is the individual who must receive this document and respond accordingly. There will be some basic facts regarding the Property and the Lease that must be recorded here on this Notice. To begin locate the sentence containing the phrase “…City of.” The blank spaces following this phrase have been provided so that you may report the City, County, Zip Code, Building Number and Street Name, and Zip Code of the Leased Property. Next, report the Calendar Date used as the Signature Date on the Lease. This must be the date the Lease was signed. Three blank spaces have been made available to report the Day/Month/Year of the Signature Date in this statement. The goal of this document will be to notify one party regarding a Lease Agreement and a Property. The exact Notice to be provided must be selected from one of the following statements. Each statement will provide terms and require information to be supplied. You may select the appropriate statement by filling in one of the check boxes and the blank spaces in the corresponding statement. A “Nonpayment” Notice may be issued by placing a mark in the first check box then reporting the following information: Authorized Agent (of Landlord) Name, the Full Dollar Amount owed in Rent by the Recipient, the full Rent Amount that is Overdue and must be paid, and the Rental Period that requires the delinquent amount considered overdue. This Notice demands the Tenant pay the outstanding Rent Amount within Fourteen Days or release the Property to the Landlord. A “Noncompliance” Notice may be issued by placing a mark in the second check box then documenting the Lease Violation(s) the intended Notice Recipient is guilty of on the blank line. A “Criminal Activity” Notice may be issued by placing a mark in the third check box then reporting the intended Notice Recipient’s observed Criminal Activity on the blank space. A “Month To Month Tenancy” Notice from the Landlord may be issued by placing a mark in the fourth check box then reporting the Lease Termination Date across the blank spaces provided. Keep in mind if the Recipient has been renting from the Landlord for more than two years, this document must Name a Date that is at least Ninety Days from the next Calendar Date the Rent is due. If the Recipient has been renting from the Landlord for less than two years, the Date must allow at least Sixty Days after the next Rental Payment Due Date. 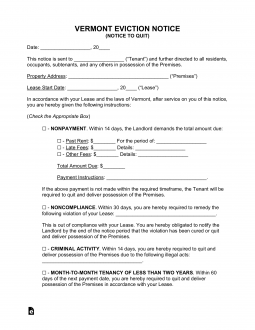 A “Month To Month Tenancy” Notice from the Tenant may be issued by placing a mark in the fifth check box then filling in the Month To Month Tenancy Termination Date utilizing the blank spaces in this statement. It should be noted that if this Tenancy has been in effect for more than two years, the Tenant must provide at least a Ninety Day Notice for the Termination Date beginning with the next Calendar Date when the Rent is due. If this Tenancy has been in effect for less than two years, a Sixty Day Notice will be required. The Landlord/Agent Signature Line at the end of the paragraph stating the Landlord Statement must be supplied with the Signature of the Landlord or Landlord Agent using this document as a Notice to the Recipient. There must be a Delivery Record provided when this document is served or delivered. Immediately below the heading “Certificate of Delivery” will be a sentence the Agent delivering this document must supply information to. This Agent will need to supply the Date and Recipient of this paperwork. The list of statements below will each define a method this paperwork was delivered. The Agent delivering this document must select one of these statements. This will define the delivery as having been made personally, being left with a second party adult who will hand it to the Recipient, or as being mailed using First Class Mail. This Agent must Sign his or her Name on the Signature Line at the bottom of this page to authenticate the Delivery Report.